Puppies may have more brains than they're given credit for, according to a new study that finds dogs, particularly young ones, are capable of following the direction of a human's voice to find food. Previous studies had shown that dogs are capable of following a pointed finger or a person's gaze in their quest for treats. In the new study, researchers from the Max Planck Institute for Evolutionary Anthropology used the direction of their voice instead. In the first series of trials, the experimenter stood behind an opaque wooden barrier and secretly placed food in one of two containers in front of the barrier. Twenty-four adult dogs of various breeds participated in the experiment. After hiding the food, the experimenter crouched behind the barrier, turned his or her face toward the treat-filled container and said, "Oh, look, look there, this is great!" The dog's handler then released the dog. In an average of 7.6 out of 12 tries, the dogs went right to the food-containing box. 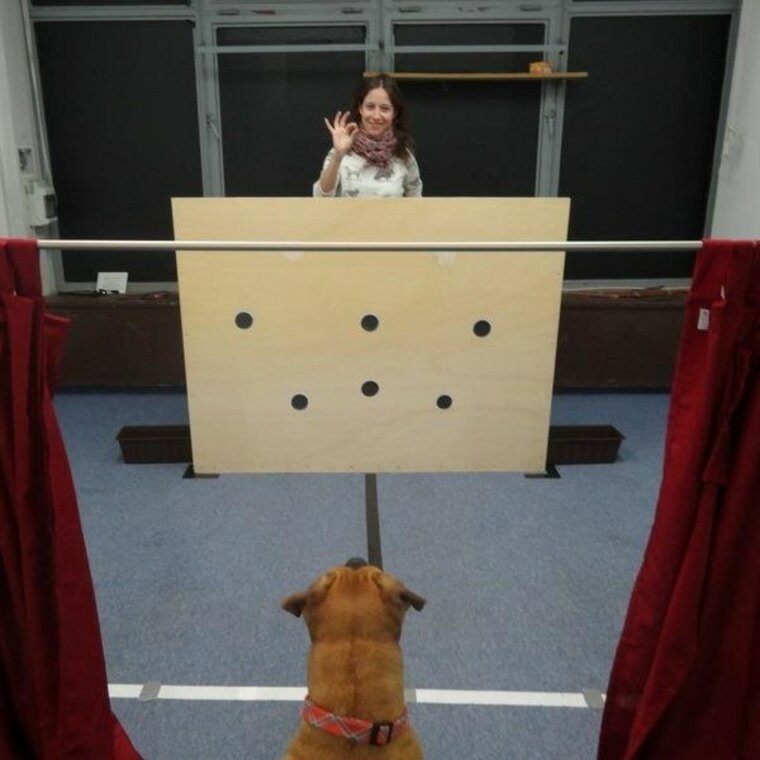 When the experimenter directed his or her voice to the back wall instead of toward either container, the dogs could not accurately guess the location of the food. These results were as good or better than those seen in previous research with human infants, the researchers reported Tuesday in the Proceedings of the Royal Society B. Was this talent learned or innate? To find out, the researchers recruited 16 puppies, ages 8 to 14 weeks, and subjected them to the same test. The puppies found the food an average of 8.1 out of every 12 tries. Adult dogs tended to use the voice cue correctly from the beginning, performing just as well on their first try as on their last. Puppies often took a few tries to catch on. The puppies that had experienced more socialization with humans did better than those with limited human interactions. "It is likely that the skill reported in this study is learned, though very quickly and through a minimal amount of exposure to humans," the researchers wrote. This is a condensed version of a report from LiveScience. Read the full report. Follow Stephanie Pappas on Twitter and Google+. Follow LiveScience on Twitter, Facebook and Google+.